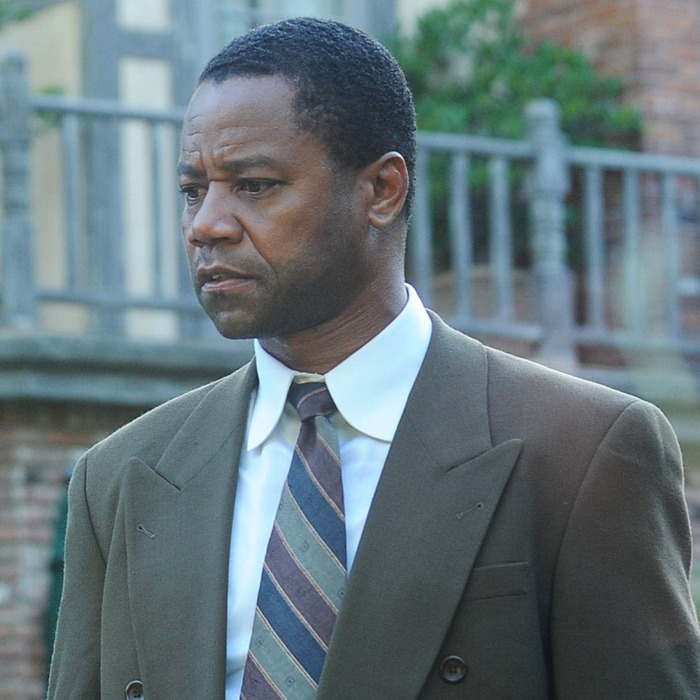 Sterling K. Brown as Christopher Darden, Cuba Gooding, Jr. as O.J. Simpson. For those who watched last week’s very special episode of Black-ish, the opening of this week’s The People vs. O.J. Simpson feels exquisitely timed. In the Black-ish episode, titled “Hope,” the family gathers around the TV as the police shooting of an unarmed black man fails to yield an indictment and the community rises up in protest. All parents of small children are naturally inclined to protect them from the terrible realities of the world, but the news forces Dre and Bow to face a difficult question specific to African-Americans: How (and when) do you tell your kids about racial injustice and police brutality? For the upwardly mobile families in Black-ish and The People vs. O.J. Simpson, wealth is no insulation from injustice or police harassment. And for Cochran specifically, misbehavior from the LAPD is less the exception than the norm. Frankly, the story O.J.’s team is telling is conspiratorial and convoluted, less believable on its face than the story the prosecution plans to tell. Clark and Darden will argue that the murders were the culmination of a pattern of abuse and obsession, and they’ll follow the trail of blood from Nicole Brown’s house to the white Bronco to O.J.’s estate. They have a motive and a “mountain of evidence.” Cochran and Co. are citing technicalities on the handling of evidence and arguing that people like Det. Mark Fuhrman made a “rush to judgment,” if they didn’t set up O.J. entirely. That’s an uphill argument, but Cochran is a superior storyteller and he’s confident that his story, based on personal experience, will be persuasive enough to cast reasonable doubt on his client’s guilt. The third reason is the thorniest: The prosecution needs Darden to make a dodgy witness more credible. The show dances around this awkward proposition beautifully. Darden knows why he’s been assigned to Fuhrman, the abhorrent racist who happened to find the bloody glove on O.J.’s estate. He can raise objections with Clark, but without much leverage, given his fresh (and therefore tenuous) appointment to the trial of the century. The most likely result, based on the response to his pre-trial motion to keep “the n-word” out of the proceedings, is that Cochran would expose his role for what it is. When Cochran whispers to Darden, “Whatever happens, don’t do Fuhrman. Make the white people do him,” it’s not entirely self-serving. It’s wise counsel that Darden takes to heart. Darden eventually gets out of questioning Fuhrman, after a couple of sessions raise his suspicion. (Closing the episode with Fuhrman standing over a gleaming case of Nazi memorabilia is a pulpy affirmation of his earlier dog-whistle racism.) But the the prosecution’s questionable faith in Darden lingers, especially with regards to his relationship to Clark, who is his strongest advocate. It’s Clark who suggests he be promoted to co-prosecutor after William Hodgman is hospitalized with chest pains, and Darden clings poignantly to her faith in him. Sterling K. Brown plays Darden as a bundle of anxiety and self-doubt, buoyed by Clark’s support, but rightly dubious of it, too, given his symbolic value as part of the team. Darden is there to tell black jurors — in the courtroom and in living rooms nationwide — that it’s okay to convict O.J. Simpson. That’s a lonely, thankless role to play. As Cochran takes over the defense, it’s been funny to see Shapiro wrapped up in petty slights, like when he dramatically refuses to enter a meeting because of F. Lee Bailey’s possible leaks to the tabloids. The makers of The People vs. O.J. Simpson have taken a clear side on the defense team infighting. Clark counts 62 instances of O.J. beating, degrading, or stalking Nicole. It’s remarkable, in retrospect, how little traction this pattern of domestic violence gained with the jury. Dominick Dunne followed the O.J. Simpson case for Vanity Fair and kept on following it for 13 years, through the civil trial and the armed robbery that accounts for Simpson’s current prison stint. He would become O.J.’s most persistent nemesis in the press, and the trial’s most evocative chronicler. It’ll be interesting to see if the series treats him as anything other than a collector of gossip, but if that route yields more scenes like the one where Lance Ito shows him an autographed picture of Arsenio Hall, it’ll be worth it. “I would be remiss if I didn’t respond to my good friend, Mr. Darden.” With those words, Cochran opens up a crater in Mr. Darden’s stomach. Neither of the crime scenes tell a story, at least not one that serves the prosecution. The clearing-away of Nicole Brown’s house — which had been up for sale, but had yet to find a buyer for obvious reasons — and the “homey” staging of O.J.’s estate naturally made her place seem sterile and his wholesome and lived-in. Once again, the prosecution has been outplayed.